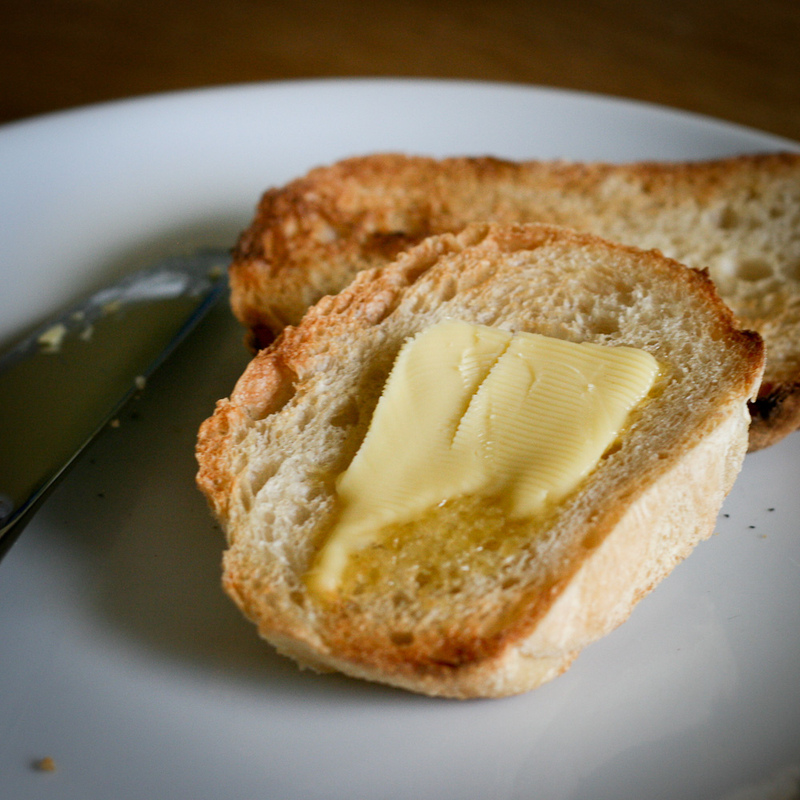 Lexicolatry: Butter - "Buttered Toast! We're Just Sitting Down to Buttered Toast!" Butter - "Buttered Toast! We're Just Sitting Down to Buttered Toast!" Verb transitive. Late Middle English. "'Buttered toast!' - you could hear his voice echoing across the lonely valley - 'We're just sitting down to buttered toast over here! Lovely slices of buttered toast!'" Of all the things that one could choose to shout - from political slogans to appeals not to fight against your fellow countrymen - this man chose to invoke and tempt the senses with thoughts of hot toast and butter, that most delicious and irresistible of staples. Orwell said he knew the man, who was shouting from further down his own line, was lying and like everyone else wouldn't have seen any hot toast and butter for months, but it still set his mouth watering on those long icy nights, and he was certain it was doing the same to the hungry fascists as well. You can just imagine the poor, conscripted sentries, shivering and hugging themselves in the freezing darkness, hunger gnawing at their insides, listening to some stranger's voice drifting through the void: "Buttered toast! We're just sitting down to buttered toast over here!" Mhmm. Could it possibly be true? "Lovely slices of buttered toast!" Butter is such a basic and ancient foodstuff (it's thought likely the consumption of butter is even more ancient than that of liquid milk), and yet it's almost unparalleled in its seeming luxuriousness. 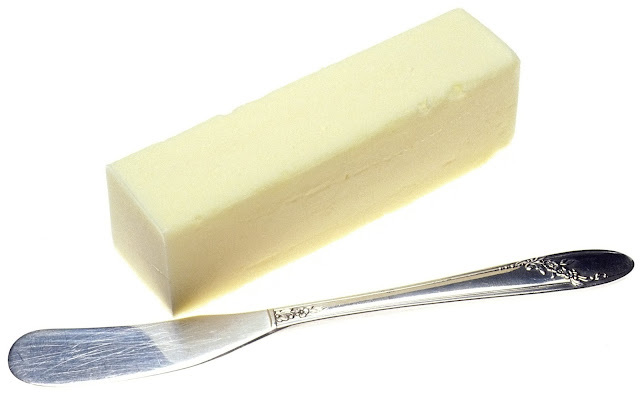 Unsurprisingly, butter has become a central component in various English idioms and expressions. You can say that someone looks "as if butter wouldn't melt in his mouth," for example, meaning that they seem demure and innocent. You might also say someone has their "bread buttered on both sides," or they "want their bread buttered on both sides," or (if they know where their advantage is) they know "which side their bread is buttered on." Does the buttercup shine yellow under your chin(s)? Are there any butyraceous expressions in your language? Do please leave your most dairying comments below. One of my favourites when I'm having 'one of those days' is "the bread always falls on the buttered side". As bread *always* falls butter-side down, how could one not have such a day? I need to know! Have you heard of the 'falling cat with a buttered-back' paradox Jingles? It's been about 17 years but I presume he's still single, or in prison, or trying to be the prime minister of Italy. Was it Hugh Grant's character in "A Butter Boy"? Oh my. That was bad even for me.